September 12, 2008 -- The Canadian Food Inspection Agency (CFIA) and Health Canada are advising consumers to avoid purchasing infant formula originating from China. While this product is not approved for sale in Canada, it is possible that it could have been illegally imported to Canada and may be for sale in some stores that carry ethnic foods. 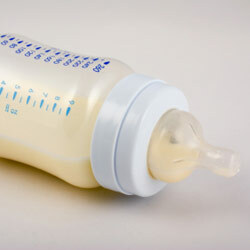 The Canadian government has become aware that melamine, a toxic substance when consumed, has been detected in infant formula which may have been exported illegally from China. Several illnesses in infants in China, and at least one death, have been linked to the consumption of this product. To date, no infant formulas contaminated with melamine have been found in Canada and, in fact, no formulas produced in China are approved for sale in Canada. The CFIA is investigating this situation and is advising consumers to avoid these products if they are found on store shelves. If consumers do have this product, they should contact us at 1-800-442-2342. The CFIA has also implemented a border lookout on milk protein products and will detain and test any suspect products found. In addition, CFIA inspectors will be checking retail establishments to determine if the formula is present in stores. All infant formula sold in Canada must be approved by Health Canada. Infant formula manufacturers are required to submit detailed information for Health Canada’s review in order to ensure that infant formula sold in Canada is safe and nutritious. Health Canada has contacted the four major manufacturers of infant formula sold in Canada: Abbott Nutritionals, Mead Johnson Nutritionals, Nestlé Canada and PBM Nutritionals. All four have confirmed that they do not use any milk ingredients sourced from China. Melamine is a chemical compound used in a number of commercial and industrial applications. Canada does not allow its use as a food ingredient. As a precautionary measure, the Agency is verifying that infant formula containing this product is not on Canadian store shelves. No illnesses have been reported in Canada related to the consumption of this product. For more information, please contact the CFIA at 1-800-442 2342 or visit our website.